And when it comes to policy, it could reshape the way roads and drill-pads are placed in mammoth energy projects on public lands in the West – that’s what turns this slice of new scientific information into a more typical news story. A proposal to drill a big new natural gas field in the Wyoming Range near the headwaters of the Hoback River was held up earlier this year while the U.S. Forest Service drafts some new alternatives for the project – incorporating, among other things, Sawyer’s surprising findings about mule deer odysseys. 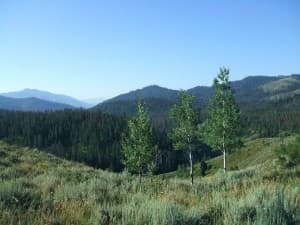 That has energy companies, conservation groups, and other users of public lands on alert: the decision on Bridger-Teton National Forest presents a rare opportunity to see whether strong, new scientific information about wildlife can significantly alter a major energy project on public land. For once, valuable site-specific data is in hand before decisions are made and development begins. 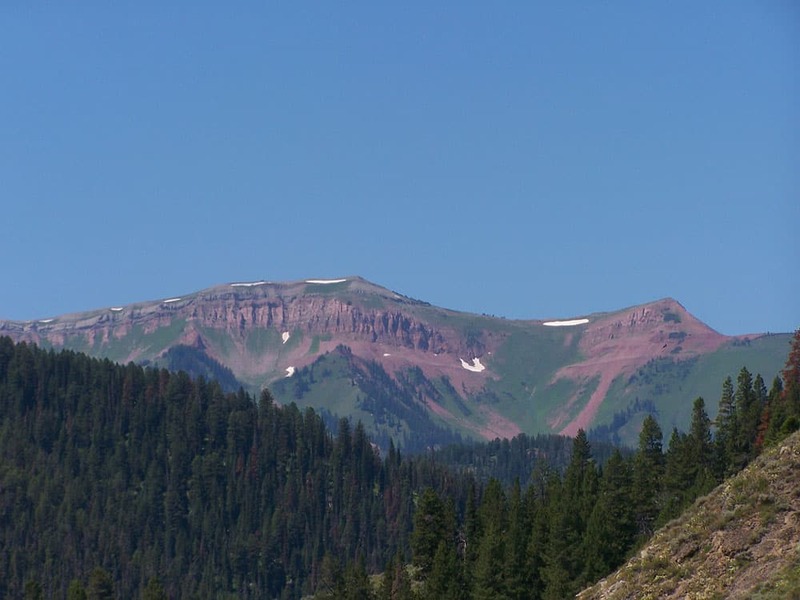 The project – a proposal by Plains Exploration & Production Co. (PXP) to drill 136 natural gas wells from 17 drill pads – would add to the swath of natural gas projects expanding from the enormous Jonah and Pinedale Anticline fields in Sublette County to the south. Conservation groups have targeted the PXP project for a number of reasons. It’s in the Wyoming Range, one of the few wildland areas which state politicians seem inclined to protect from development. It’s under the jurisdiction of the U.S. Forest Service, an agency viewed as friendlier to conservation than the U.S. Bureau of Land Management. It’s closer to Jackson, with its eco-friendly population, and some special conservation legal tools, including stipulations that could restrict the location of wells. Finally, opponents have some scientific ammunition, in the form of long-term studies by Hall Sawyer and others that show major impacts of energy development in western Wyoming on mule deer herds, pronghorn, sage grouse, and other species. 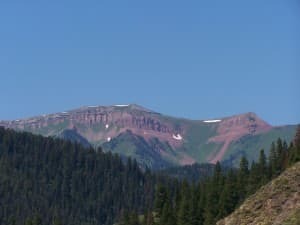 But seven years has also given the public, and the conservation community, more time to focus on a project that would drill in the headwaters area of the Hoback River, a federally designated wild and scenic river. American Rivers, a national group advocating protection and restoration of rivers, has put the Hoback on its “most endangered” list, and groups like the Citizens for the Wyoming Range and the Wyoming Outdoor Council want PXP’s 17 well pads scaled back, if not blocked altogether. Biologists and other scientists are reluctant to weigh in publicly on large-scale public land policy decisions, where economic concerns, politics and powerful industries are often in play. They simply want to see science given its due. 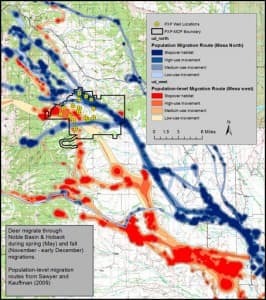 Sawyer’s earlier studies of mule deer declines connected to energy development in the Pinedale Anticline have not slowed the expansion of Anticline energy production; but this time, the research is in hand before drilling begins, and it shows that crucial stopover sites along several mule deer migration routes coincide with PXP’s proposed well pads. Lisa McGee, National Forests & Parks program director for the Wyoming Outdoor Council, hopes this time science might trump the industry juggernaut. Add to this the excitement – a particular biologist-sort of excitement – generated by Sawyer’s application of the “Brownian Bridge movement model” to determine a pattern of ungulate migration that no one knew about. “It’s great and good stuff, truly important,” says an excited Gary Fralich, a Wyoming Game & Fish Department biologist who’s studying moose in the same area. And it could, if applied to the PXP plan, radically alter a major energy development project. I first met Hall Sawyer four years ago, when we hiked around the rough sagebrush country in the western foothills of the Wind River Mountains near Boulder, Wyoming, in Sublette County, looking for a mule deer collar with a radio transmitter that had stopped moving – in other words, a dead deer. Sawyer had begun this work as a graduate student at the University of Wyoming, and he’d been working for nearly a decade on studies of ungulate migrations, including long-term research on the Sublette mule deer unit, which happened to share some landscape with the giant natural gas discoveries of the last decade, including the Jonah and Pinedale Anticline fields. Sawyer raised the transmitter over his head, glinting in the sun, swiped at the flies, and checked it. Collars get smarter all the time – if a spotting plane flies once a month picking up the GPS locations of collared animals, biologists can get a fairly exact picture of their travels. This doe, like most other mule deer, and pronghorn, passed every year through Trappers Point, a migration bottleneck near Cora Butte where Indians camped every year and filled their larder. Human migrators still come through here, but now they’re in semi’s and Winnebagos, and the mule deer and pronghorn have to dodge across sometimes heavy traffic on Highway 191. There’s a lot of migrating going on. If you were a mule deer, you might feel a little resentment – pronghorn, which travel the longest ungulate migration route in the Lower 48, are the poster child for migrations-in-danger in these parts. Their journey from Grand Teton to as far south as I-80 includes steep paths through the Gros Ventre Mountains and tip-toe trails amidst the drill rigs. While Berger’s data showed the pronghorn doing all right, the mule deer were crashing. The Sublette herd has two segments, one on each side of north-south Highway 191. The segment on the east side of the highway where Sawyer and I hiked lives on land that, as yet, has had no energy development. It’s a rough life east or west, as the carcass at our feet suggested, but east of the highway, the winter herd population was replenishing itself and maintaining numbers between 6,000 and 8,000 over the last decade. On the west side, though, in an area with a distinct Mesa newly dotted by drill rigs, it was a different story. “Through the first five years on the Mesa we’ve seen a 45 percent reduction in deer numbers,” Sawyer said in 2008 as we hiked back to the truck. Although his contract, at the time, was being paid by Questar, Ultra Petroleum and other energy companies as part of their mitigation requirements, he wasn’t shy about assigning blame to oil and gas development. “We’ve got so many radio-marked animals we’ve been able to tell whether deer actually leave the area. 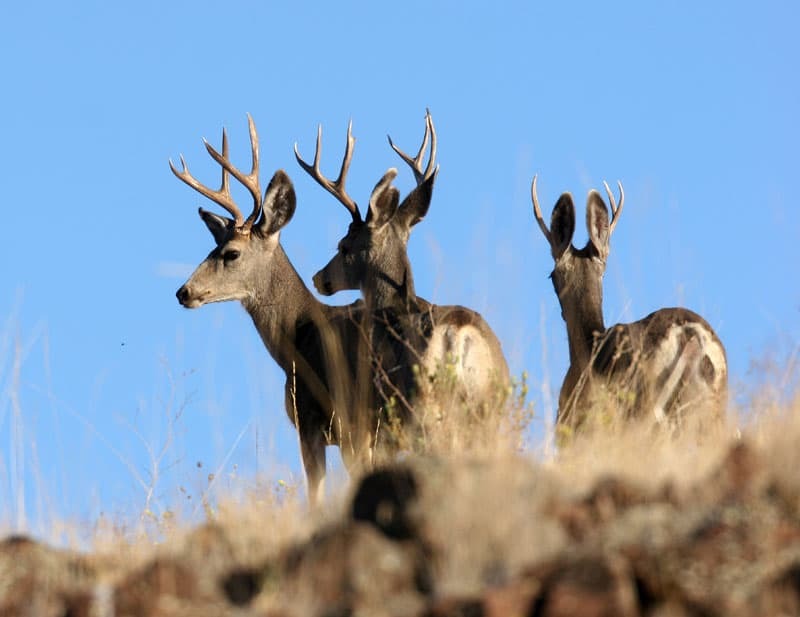 … The idea that the mule deer are just moving somewhere else and that’s why we’re seeing the decline just isn’t what’s happening.” The mule deer are dying. Then, a key discovery lifted Sawyer’s mood. A recent paper, written with Matthew Kauffman of the Wyoming Cooperative Fish and Wildlife Research Unit, has Sawyer excited, even hopeful. “Stopover Ecology of a Migratory Ungulate” was published in May 2011 in the Journal of Animal Ecology. The finding is simple, perhaps even obvious. When mule deer migrate long distances, rather than make the trip in a beeline, they dawdle, pausing for days and weeks at “stopover sites” along the way. Amazingly, this is new information, and it came from evolving GPS tracking efforts. Ungulates like deer, elk and pronghorn, it was assumed, had a seasonal switch that set them off rushing from summer to winter range, and vice versa. Since some of these corridors were extraordinarily long – pronghorn can travel as far as 200 miles from Grand Teton National Park to the Red Desert – corridor conservation was an almost impossible challenge in the face of big new energy projects, fenced subdivisions, proliferating roads, and new building in the migration pathways. Inexplicably, the new U. S. Bureau of Land Management office in Pinedale was built, smack-dab, in a migration corridor. It’s more the way birds travel, dropping down into wetlands to refuel on their long journeys. But there is a distinct difference between avian and ungulate: the tempo. Birds travel in a hurry, “optimizing food loads” and taking off again. Mule deer, in the spring, are almost languid in their journey, scaling higher elevations as they move north and stopping for days at sites they’d used for years, expertly timed just prior to “peak green-up, when forage quality was presumed to be highest,” according to the Sawyer/Kauffman paper. The stopover phenomenon was easy to overlook in past studies because it was rarely possible to identify a particular animal at the beginning and end of its migration, nor could scientists put frequent checkpoints along the lengthy routes. Rapid advances in GPS technology over the last decade have changed all that. New collars collect location data every two hours, 365 days of the year, with high resolution data. The information is stored aboard the collar, which is programmed to drop off in two years, usually at a time of year when the animal will be at a lower elevation. “It’s good and great stuff,” said Gary Fralich, Wyoming Game & Fish’s South Jackson Wildlife biologist, who is studying moose in proposed energy development areas. Fralich rhapsodizes about the way Sawyer applied the Brownian Movement Model – which, if this helps, is defined in a 2007 paper in Ecology: “based on the properties of a conditional random walk between successive pairs of locations, dependent on the time between locations, the distance between locations, and the Brownian motion variance that is related to the animal’s mobility.” There you have it. And here’s where we come back to the PXP project (formally called the Eagle Prospect and Noble Basin master Development Plan). The proposed gas field would be situated in the Wyoming Range near Bondurant, including the headwaters of the Hoback River, and outside the area protected by the Wyoming Range Legacy Act. 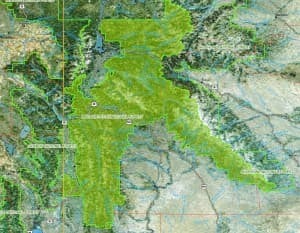 The Bridger-Teton National Forest’s latest Supplemental EIS was released in the face of increased public scrutiny, including demands that the Forest Service strictly apply stipulations in the lease restricting surface occupancy, which conservationists say could cut the disturbed area in the proposed project by two-thirds. There have been rumors of negotiations to buy out PXP’s lease hold in the area. Sawyer’s mule deer data could – emphasis on ‘could’ – be another impetus to change PXP’s plans. Or not. There is 10 years of data on mule deer on the Mesa in the Pinedale Anticline, and the population is being allowed to crash, apparently due to human activity in critical winter range, according to Sawyer’s data . 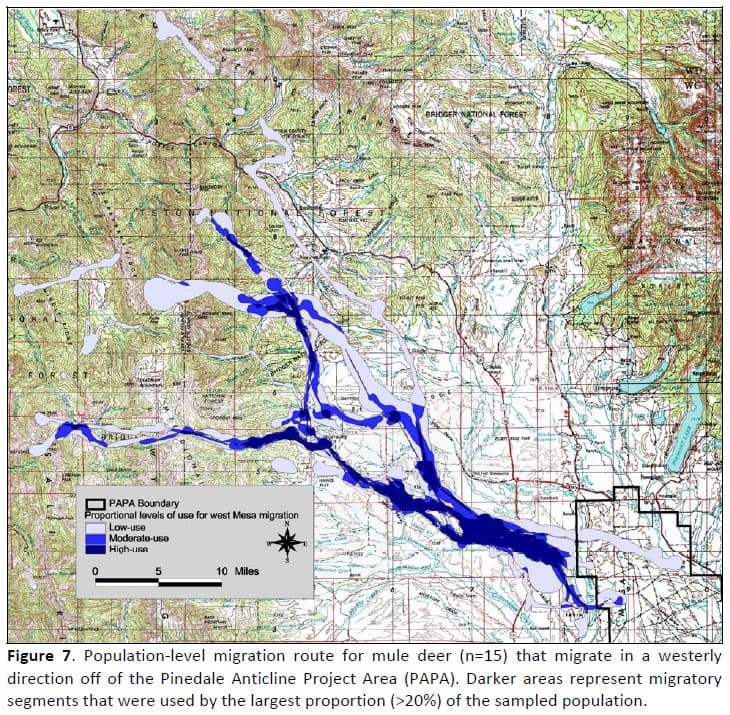 But those Anticline studies providentially include mule deer that migrate north through the PXP area. Sawyer uses that data to identify stopover sites, and suggests the Forest Service could require that those sites be kept clear of rigs and roads and people, especially during the periods the mule deer use them. It wouldn’t be everything the conservation community wants – that would be a complete ban on development – but with both PXP and the Forest Service insisting that the companies’ right to drill is already decided, Sawyer wants to be sure the importance of stopover sites, at least, is recognized. 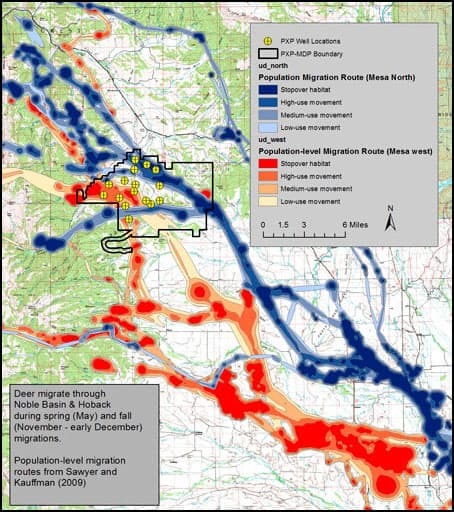 If the PXP project moves forward, Sawyer suggests that the essential project infrastructure – those roads, rigs and people – could actually be located in the migration corridors in order to spare the stopover sites. It sounds counterintuitive, but Sawyer says, mule deer on the move will cross roads. It’s the places where they stop and forage that the “do not disturb” sign must be posted. Opponents of the PXP project still hope the project can be stopped entirely. They are worried about the kinds of air pollution experienced in the Pinedale area (the potential for ozone spikes from gas field emissions is the primary concern), and also water quality (PXP will use hydraulic fracturing — or “fracking” — and must also manage large volumes of potentially toxic waste fluids), and surface damage to a beautiful viewshed. Wildlife advocates say there are other species in jeopardy, too, such as elk, and the moose that Gary Frahlich is collaring in a study underwritten by PXP, the state, and the Bridger-Teton that will arrive after a decision is made about whether, and how the PXP project moves forward. Natural gas prices have dropped precipitously this year, to just under $2 per mcf in Wyoming, but PXP officials show no sign of faltering resolve. In fact, PXP is among about a dozen oil and gas operators that, collectively, propose drilling some 20,000 new gas wells in western and central Wyoming over the next two decades. Forest Supervisor Jacque Buchanan has no regrets about reworking the project plan and creating new alternatives. When she took over at Bridger-Teton in July, 2010, arriving from the Lincoln National Forest in New Mexico, she was told the review process on the PXP project’s environmental impacts was virtually complete. Right away, she saw problems. The public hadn’t been notified about road density changes, a requirement under the Bridger-Teton’s 1990 Forest Plan. The project also could be subject to the Jackson Hole Oil and Gas stipulations, which limits drilling near public roads – a special protection for that special corner of the state. Both those things, along with Sawyer’s science, will be considered in the new draft Supplemental Environmental Impact Statement. Buchanan expects the new version to be out near the end of May, followed by a 45-day public comment period. If the last draft is any indication – 60,000 comments poured in – this decision-making process will be much scrutinized. PXP continues to show considerable forbearance and resolve. The federal permitting process for PXP’s proposal began with a requirement that the company develop a plan for full field development, where many projects begin with a less elaborate Phase 1 that only involves the plans and impacts for exploratory work. The company has negotiated with the state and with groups like the Wyoming Outfitters and Guides Association and Wyoming Sportsmen for Fish & Wildlife to drop 28,000 acres of its federal mineral lease and devote millions of dollars to protecting and studying habitat and air and water quality. Buchanan insisted that she does not feel inordinate pressure from either the energy industry or the conservation community, but there are voices on all sides, including two Wyoming governors who have chimed in. She repeatedly states that PXP’s right to drill is unquestioned – and she is merely following “the good process laid out under NEPA (the National Environmental Policy Act), and let that drive us.” She noted that Hall Sawyer’s mule deer studies and stopover data will be incorporated not just in the two new alternatives, but in revising the old alternatives as well. And there will be language to allow changes in the plan when the moose studies are completed in 2013. Geoffrey O’Gara is one of Wyoming’s most accomplished journalists and writers. Geoff is a Wyoming Public Television producer and host of the influential Capitol Outlook and Wyoming Chronicle programs. He is the author of What You See in Clear Water: Indians, Whites, and a Battle Over Water in the American West (2002) and A Long Road Home, Journeys Through America’s Present in Search of America’s Past (1989) and several other books. An avid cyclist, basketballer and fly fisherman, he lives in Lander. I would like to challenge any organization that is capable…to develop a site to allow individuals to contribute to permanently retiring the leases grandfathered into the Wyoming Legacy Act. One look at the Jonah field, and it moved me to bitter disappointment and frustration. I think the outpouring of support would be enormous! Thank you so very much for the very detailed and insightful article. The Hoback Basin is a critical ecosystem and hopefully the outpouring of support to retire these leases gets the point across. Keep up the great journalism! Nothing less than a pivotal study and article. Very well written and informative. It is like Doahh! why didn’t this dawn on us before? How many years did I watch the elk staging, aka stopping over, on Burro Hill waiting for the “right” moment to migrate onward and upward into the Teton Wilderness and Yellowstone. Thanks! Excellent article, Geoff! Thank you for covering such a complex topic. I have only one correction to point out. All of PXP’s leases proposed for development on the Bridger-Teton DO fall within the boundaries of the WY Range Legacy Act (they were grandfathered.) So if PXP sells them and they are retired – it will be permenant. Again, thanks for your great reserach on this! Thanks Geoff for the great article. After having lived in Wyoming most of my life, we recently moved to Montana. I frequently shudder when I people here say that they wish Montana could be more like Wyoming when it comes to developing natural resources. I reply, “Be careful what you wish for!” This article will give me more information when I tell them that dollars in the state treasury may not be with the cost. I highly respect Hall Sawyer so will carefully evaluate this piece. Good work, Geoff. Very interesting. Please, please, please take a look at the Scott Well proposal on the Wind River District of the Shoshone National Forest, just north of Dubois before it is too late! The issues raised in this article and the cited studies have great bearing on what could become a true wildlife catastrophe involving a large (2,000 head) migration, birthing and stop over corridor for elk. Wyoming citizens own a large piece of the winter range for this herd, paid for with large amounts of State financial and political capital. Recovery of the wolf and the grizzly in the Dubois area is greatly dependent on this migration. Now it seems that the sacrifice of this incredible resource is inevitable. The effort to drill with the hope of full field development cannot be influenced by any local citizen input. We need the “light of day” focused on this potential loss of immeasurable value so that all know what is being done.